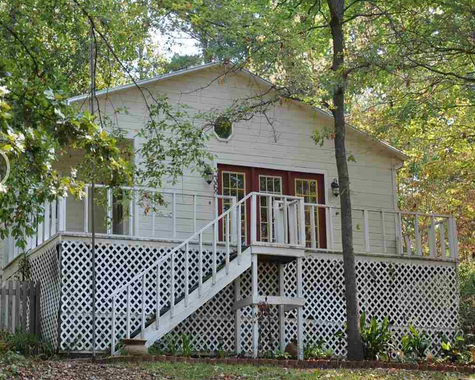 This is a beautiful one bedroom, one bathroom cottage located in Big Sandy, Texas sitting on one acre of waterfront property. It consists of two separate buildings – one with the guest quarters containing a large bedroom and full bath just steps away from the second building, which consists of a living room, kitchen, and dining room all in one sizable room. In addition, a porch wraps around the large deck with stunning views of the lake as well as ample shade provided by surrounding trees. It would make an ideal weekend or summer cabin as well as a year-round home for a permanent resident. The cottage sits in peaceful surroundings and offers a lot of character. The entire home has central electric heating and cooling air throughout both buildings as well as a wood burning stove situated in the main living room area for a cozy, rustic feel. The kitchen features both an electric oven and cooktop as well as a dishwasher and designated pantry space. 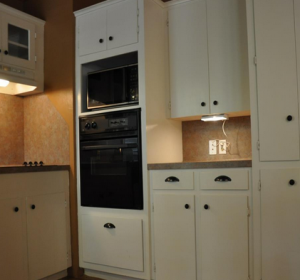 Additional features that add comfort and safety to the interior of the cottage include: ceiling fan, cable television hookup, smoke alarm, blinds, and a utility closet. This home has a variety of exterior features that make it unique including wood based siding and both an open porch and patio. There is also a wood fence surrounding the exterior of the property with an excellent view of the lake. Security lights surround the home for safety and it also includes gutters and a paved street with parking available in the driveway. The home is a beautiful one to view from the exterior as well as the interior. Big Sandy is a small town in northeastern Texas that boasts a tight knit community of fewer than 2,000 residents situated mainly on Big Sandy Lake. With U.S. Highway 80 running right through the main drag of the town it is an easy commute to nearby cities such as Gilmer but remains a quiet and peaceful town for residents. Community members are proud of their winning high school football team and exceptional reputation of their independent school district. Downtown Big Sandy is quaint and has all the necessities for a weekend or summer cabin vacationer as well as a permanent year-round resident to live comfortably and happily in this cottage. In addition, the home sits perfectly located on a dead end road for true peace and tranquility. This cottage features a conventional septic system and cooperative water. The remainder of the utilities are up to the new homeowner to determine. As previously mentioned, a cable television hookup is available for residents to utilize. A private viewing of this home can be scheduled at any time. It is a wonderful place for a single individual or couple to live all year round or for a small family to use as a weekend or summer getaway. The home features all the necessities as well as a stunning view of the lake and is located in a small neighborhood suitable for every personality.